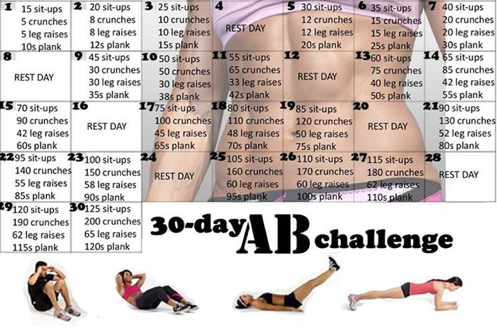 Feeling a little blubbery, and discover right in my facebook feed a 30-day ab challenge. The first day seemed really easy on paper, but when I just got down on the floor to do it, it seemed hard. I didn't take any breaks in between the exercises. I pushed right on through. In 30 days, I'll probably have a two- four- or six-pack. If I lose a few pounds. So, you're saying it's not very hard to do? It looked easy on the calendar, but it was hard to do. Today I did Day 2. I got through it. I'm expecting huge results. We shall see. Wow! I need core help, but this looks super challenging.